This post may contain affiliate links. What does that mean? 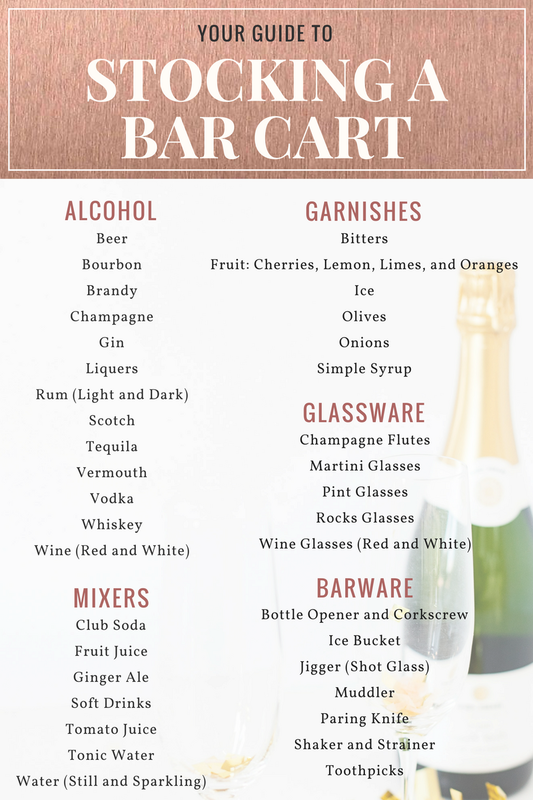 Although we've had our bar cart for awhile now (it was a gift from John, late last year), we just finally got around to stocking it because we had a party this past weekend. Sure, we had some things on there, like the crystal rocks glasses and a massive bottle of Grey Goose, all of which I pilfered from my parents' house, this was the first opportunity we had to go out and buy some things that weren't just for us. Because that's a bar cart's purpose, in my eyes: to serve the people I invite into my home. I like it to be ready with the things people generally like. Of course it's not going to be like a bar or restaurant, stocked with any and every drink and garish someone could possibly want, but I can cover some solid basics. So I made a little graphic for you, covering the essentials. And a couple of nice to have extras, because how many times do people really ask for bitters? It does happen though! Now you'll be ready. Personally, I don't recommend heading to the liquor store and stocking up on everything on the list in one fell swoop. It would cost you a lot. This is something you can build over time, as far as getting 'the good stuff' goes. But in the meantime, here's what I recommend splurging versus saving on, if you're planning on stocking a home bar yourself. The liquor you use most and it's corresponding glassware. My aunt swears by good champagne, and the nice glasses to match (they need to have a very pointy bottom for the bubbles to hit and bounce off of or something.) She says it tastes better. Me? Tastes the same as $10 Korbel in a solo cup. She also says the good stuff won't give you a hangover. But let's get real, I consume champagne in quantities at which a hangover is unavoidable. Likewise, John's brother, Eric, is a huge craft beer person, who will spend crazy amounts to get limited edition IPAs and says there's a different type of glass for each type of beer. If you're wondering which type of alcohol and glassware I splurge on, the answer is none. I'm not picky in this regard. But I recognize the importance for people who care! Paring Knife. If you're going to get a knife for the fruits and other garnishes, make it a good one. I think anyone who has tried cutting oranges with a dull knife knows the importance here. Also a must have for making pretty swirls out of fruit peels. It's really not that much more to get one good knife than it is to get several crappy ones, especially considering how often you need to replace the crap ones. A nice one will be $10-$20. Toothpicks and other one time use items. If you're conscious of zero waste, then by all means, get the reusable toothpicks (and straws, and napkins, and whatever else your cart needs.) But if you prefer the ones your guests use and dispose of at the end of the night, don't spend much here. I know it looks super cute to have fancy umbrella toothpicks and gold striped paper straws sitting out on the cart's surface, but if you regularly host people then you're going to plow through these items and toss your money down the drain constantly replacing them. Wine. I preface this by saying I'm not a wine person at all. But I have friends that are huge wine people and they will tell you the same - there are more and more great wines at cheap price points becoming widely available, especially at places like Costco and Trader Joe's. Apothic is hugely popular for this reason, and you can get it at Target. Ice Bucket. They all do the same thing and perform the same way. I've never had a stand out ice bucket that's been better than any of the others. Don't try too hard here. At least, those are the tips that worked for me! Do you have a home bar? What are your splurge items for it? Anything to add to the stock up list?